The actor Matsumoto Kôshirô IV held the name of Ichikawa Somegorô I from the 11th lunar month of 1762 to the 10th lunar month of 1763. Date of birth unknown. 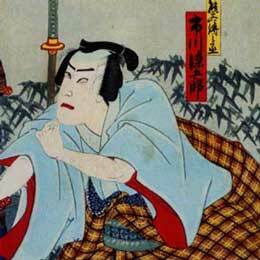 He started his career in 1761 as a disciple of Ichikawa Komazô II, who gave him the name of Ichikawa Matsubei. 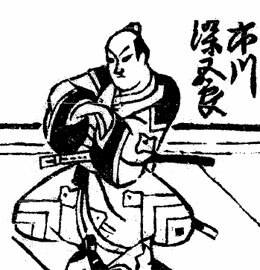 He took the name of Ichikawa Somegorô (but he was not acknowledged as an official member of the line) in the 11th lunar month of 1766 at the Moritaza, performing in the kaomise drama "Tsuno Moji Izu no Irifune". He went to Ôsaka in fall 1771 and took the name of Ichikawa Otojûrô in the 11th lunar month of 1771 at the Naka no Shibai, performing in the kaomise drama "Temomutsumajiya Ryûgû no Shimadai". He settled in Kyôto in Fall 1772, where he took the name of Ichikawa Ikuzô in November. He went back to Edo in Fall 1780 after 9 seasons spent in Kamigata. He appeared on stage for the last time in the 5th lunar month of 1795, at the Kiriza. He died in Edo the 15th of the 6th lunar month of 1798. 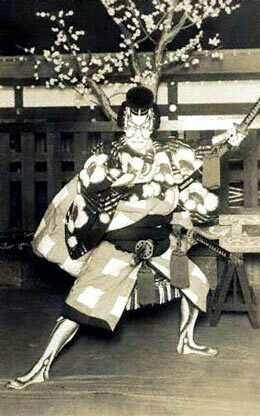 Ichikawa Ikuzô was a talented supporting actor, who was able to perform a wide range of roles as a katakiyaku, dôkegata or tachiyaku. He was the father of Nakayama Tomisaburô I. There will be in the future to come a full page dedicated to Ichikawa Ikuzô in kabuki21.com. He started his career in 1769 as a disciple of Ichikawa Komazô II. His first stage name was Ichikawa Somezô. He took the name of Ichikawa Somegorô II in the 11th lunar month of 1773 and held it up to the 3rd lunar month of 1783 when he became tôdori at the Moritaza and took the name of Bandô Tarosuke. He died in 1828. The minor supporting actor Matsumoto Takejûrô, a disciple of Matsumoto Kôshirô IV and his son Matsumoto Kôshirô V, was the son of Bandô Tarosuke. He held the name of Ichikawa Somegorô III from the 11th lunar month of 1795 to the 10th lunar month of 1805. Almost no data available. The actor Matsumoto Kôshirô VII held the name of Ichikawa Somegorô IV from March 1890 to April 1903. The actor Matsumoto Hakuô held the name of Ichikawa Somegorô V from April 1931 to August 1949. 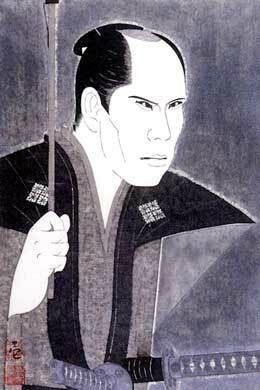 The actor Matsumoto Kôshirô IX held the name of Ichikawa Somegorô VI from September 1949 to September 1981. Ichikawa Somegorô VI playing the role of Ôishi Kuranosuke in the drama "Genroku Chûshingura"
The actor Matsumoto Kôshirô X held the name of Ichikawa Somegorô VII from October 1981 to December 2017. Ichikawa Somegorô VIII is the current holder of the name since January 2018.